Q. It went easier than you would have thought? RAFAEL NADAL: Sure, this is true. Very positive result for me. I think very good start. Very important, no? Always before the first match you always have the doubts, especially in this situation I'm arriving here. Never easy, but it was an important match for me. Every match is very important for me today. Was a comfortable victory that give me some confidence. Q. When you're coming back from an injury layoff, how important is the strength in the mindset? RAFAEL NADAL: At the end you know that you not going to be at your 100%, so most important thing when you are coming back is accept all the challenges, the weeks, months, that you didn't have the chance to be able to practice, to compete. That you will have for sure. Just accept every situation. Accept that you're going to be a little slow, a little out of rhythm. You can practice a lot. I did. I practiced I think enough and with the right attitude, but at the end what you need is matches. You practice very well, but you don't have matches under your shoulders. You cannot play with the right confidence, with the right competitive spirit, because you need to feel that. All the practices, you don't get that. The only way to get that, you know, is having matches. That's why this victory today is very important, and every time that I am on court competing is a big help for me to try to be back on the right level that I want to be. Q. Looks like you're going to play Tim Smyczek next. Do you know anything about him at all? RAFAEL NADAL: I don't know very well. I talked little bit about. But he's losing the third. I don't know what's going on. But, anyway, for me always, but especially today, all opponents are dangerous. All opponents are going to be difficult, and with the maximum respect for everybody and knowing that anything can happen in every round against anyone. So just going to go on court with the same spirit as today, maximum respect, trying to be very focus, and try to play little bit the same way like I did today. I think I did very positive things. I am trying to improve in the thing that I need to improve a little bit more. Q. Mikhail says he thinks you can be very dangerous in the second week here. Has today changed your opinion of how far you think you can go here? RAFAEL NADAL: No, no. What I say the other day is the real thing. Today is very hard to speak about having chances of nothing. I have one match. That's better than two days ago. But I need more to feel that I am ready for something very important here, no? So is not the right moment to talk about that. It's the moment to really give to this victory the right value. That's very important for me. And try to be ready for after tomorrow. Q. In the many months you were out of the sport, what was the moment when you most appreciated tennis, and what did you appreciate about the game? RAFAEL NADAL: I always had lot of passion for this sport, for sport in general. That's the real thing. As a fan, as a player, as a professional player, as everything, playing amateur golf, football, anything. When I am able to do some sport, I always try my best and enjoy doing. And, seriously, the last seven months that I only played four matches, four, five matches, have been tough. But at the same time, is always the same. Was a lot of accidents, so just trying to accept every situation and trying to enjoy different things. That different things is being at home, being with the family, parents, cousin, sister, friends, trying to enjoy little bit of the beautiful island from where I am, Mallorca. In general, I was happy during these seven months, but is obvious that I know that I hope to have the chance to do that in the future. Tennis career is not forever. So always when you're not playing in Indian Wells, when you're not playing in Toronto, when you are not playing in Cincinnati, the US Open, in the World Tour Finals, in Shanghai, in Bercy, you know that you are missing important opportunities for your career. So that's not good. But that's part of my career, too. Q. Is there something you've done today on court that you're especially satisfied with? 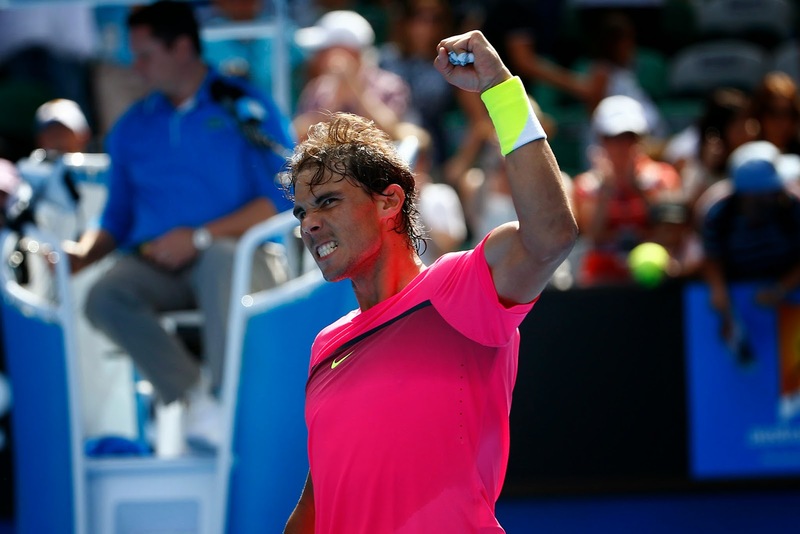 RAFAEL NADAL: I think I returned well. My return worked really well. The serve, too. I served, I think, the right way, with only one breakpoint during the whole match. And in general I played with not many mistakes. I didn't have lot of mistakes, but is true that when I am defending, I can arrive with little bit more confidence and try to hit the ball longer. The only way to have that is winning. And playing this match of tomorrow I will do it better. If I am able to win tomorrow, I will have a chance to do better next time. That's always the way that you become better and you become confident: winning. The victory is everything in the sport. Q. Do you think it's harder for a player who is shy to be successful on the tour? If you're more introverted, do you think it's more difficult to win those big matches and have success? RAFAEL NADAL: No. I was really shy when I was a kid. I started on the tour very early with 16, and I was very shy. Well, I was not shy playing on court. That's the most important thing, no? You can shy in life, but obviously when you are going on court, when you are competing, you compete. You cannot be shy. At the end is obvious if you are shy playing, probably you will be in trouble. But the normal thing, if you are a good junior, all your life you did that, it's difficult to be shy on court. You can be shy outside, but on court, is the thing that you do, you are by yourself, and probably will not happen. Q. Can you talk a little bit about your new racquet, if it's required any adjustments in playing. What sort of information do you find useful after the match? RAFAEL NADAL: The racquet for me is very similar one to the last one. Didn't change almost nothing. The new Babolat is a new technology that probably will be the future in our sport. I think is great that Babolat did that. Is a big improvement for everybody who loves our sport, no? For the kids, for the amateurs who plays the sport, who plays tennis, and for professionals. At the end, we are professionals. We arrived here without using this technology, so it's a little bit more difficult to adapt to this. But is a help, no? When you finish the practice, is a help to see - or a match - how many forehands you played, how many backhands so you know you are doing the right thing. For example, I know to play well I need to play 70% of forehands; 30% of backhands. If I'm not doing that, I know I not doing the right thing on court. That's a way that you can check these kind of things. Then for amateurs is good to compare after the match where they're hitting the ball, after practice where they are hitting the ball. They can compare with another thing. At the end is fine for the people who has passion for this sport, for tennis, no? I think is great. I am really sure that in the future everybody will use that. Q. When you come out onto the court and you sit down on the bench, do you turn it on? RAFAEL NADAL: I think I did before I start. Q. Jim Courier was talking about back problems. He said when you're a back patient, you're a back patient really for life. It's something you have to take care of your whole career, your whole life. Is that the case for you? RAFAEL NADAL: I don't know. I don't know. Last year was tough year with my back because I had problems here, then in Rio, then in Roland Garros, then I didn't have more because I didn't play more (smiling). But for the moment, for this year, I am feeling well. The back is not limiting me, so that's important for the moment, no? I know the back is dangerous. I know the back is a thing that you have to take care about. We are trying to do the right things to be safe with that, but there is things you cannot control. Q. Your shorts seem a lot shorter this year than before. Is that a decision you've made or something that's come from your sponsor? RAFAEL NADAL: No. To make the shorts shorter is something that I like. I feel more comfortable this way. We make it shorter already last year, and this year a little bit more. I like. I feel more comfortable here, more fresh. Sometimes is good to have some changes, to try different things. But seriously, I prefer this way.